'ND Genesis' was developed by the NDSU Barley Breeding Program and released by the North Dakota Agricultural Experiment Station in 2015. 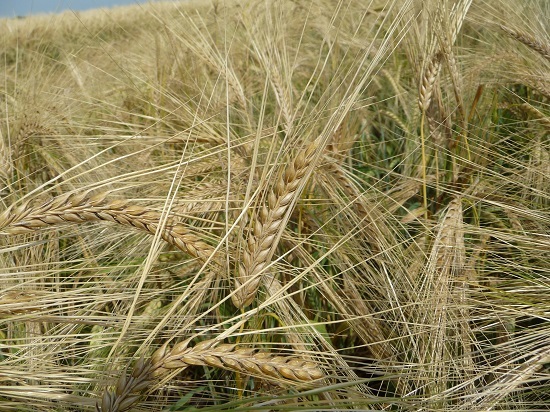 'ND Genesis' is a high yielding two-rowed barley variety. Based on eight years of the barley breeding program yield trials across North Dakota, 'ND Genesis' has about a 5% yield advantage over 'Pinnacle'. The average yield advantage is over 8% in eastern ND and nearly 3% in western ND. The test weight of 'ND Genesis' is similar to that of 'Pinnacle'. Results from micro-malting tests show that 'ND Genesis' and 'Pinnacle' have similar percent grain protein. 'ND Genesis' has medium-strong straw strength and medium-late maturity. 'ND Genesis' is slightly taller than 'Pinnacle', 'Lacey', and 'Conlon'. Resistance to lodging is superior to that of 'Conlon'. 'ND Genesis' has large, plump kernels, and good malt extract values. It accumulates less deoxynivalenol (DON) and has lower beta-glucan values than 'Pinnacle'. 'ND Genesis' accumulates around 20% less DON than 'Pinnacle'. Kernel plumpness of 'ND Genesis' and 'Pinnacle' is similar. This variety has semi-smooth awns, long rachilla hairs, and white aleurone color. 'ND Genesis' has good disease resistance. It is moderately-resistant/resistant to the net form of net blotch, moderately-resistant to the spot form of net blotch, and moderately-resistant to spot blotch based on greenhouse seedling evaluations. This variety has better resistance to the net and spot forms of net blotch than 'Pinnacle', and similar resistance to spot blotch as 'Pinnacle'. Compared to 'Tradition', 'ND Genesis' has better resistance to the net form and spot form of net blotch. The improved foliar disease resistance and yield potential of 'ND Genesis' as compared to 'Pinnacle' make it a possible replacement for 'Pinnacle. 'ND Genesis' seems adapted to all areas of ND and adjacent parts of MN, MT, and SD where barley is grown. Its large kernel and low grain protein traits may be helpful when growing malting barley in environments where moisture stress occurs after heading. Besides the Upper Midwest production area, 'ND Genesis' also has some promise in the spring barley production areas of the eastern USA where growers producing barley for the craft brewing market have been growing 'Pinnacle' because of its low protein. To help ensure genetic purity, 'ND Genesis' is protected under the Plant Variety Protection (PVP Certificate No. PV201600264) under Title V and must be sold as a class of certified seed.